These brown tabbies are sweet natured! 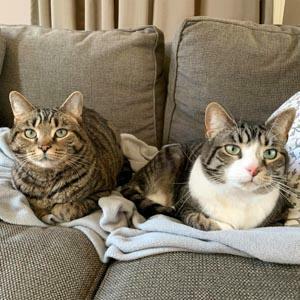 JULIA & OSCAR are a fun, cuddly, social pair of kitties. They have incredibly soft fur which feels like silk when you pet them. They are equally happy playing with each other or snuggling up next to people. They settle into a new home right away and always greet their human friends at the door when you come home. They are a bonded pair and need to be adopted together. JULIA has an adorable nose which is half pink, half brown. She is a sweet purring machine who loves being petted. When you meet Julia, it's easy to see why she usually gets her way! She has an outgoing personality, and isn't shy about letting you know what she wants. 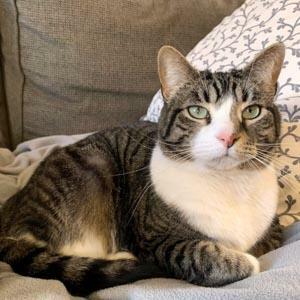 Julia is very good at keeping herself entertained with toys – batting toy mice around her foster home – up and down the stairs and flinging them across the room. OSCAR has beautiful sea green eyes. He has a sweet personality and is always up for cuddles or down time. Oscar also likes to play but prefers interactive play with people or his sister. He seems to need his prey to move around on its own! Wave a cat dancer around and Oscar will go nuts! 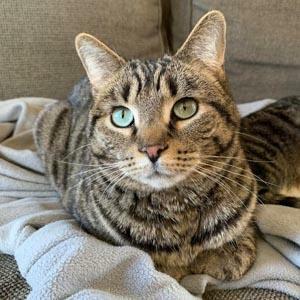 Even though Oscar is generally sweet, he can get a little testy with a nip or swat if you pet him or move him when he wants to be left alone. So no young children for this playful boy. Oscar has food and/or environmental allergies that cause bumps on his neck and chest. He's under the care of a veterinary dermatologist and is being treated with hypo-allergenic food and medication (Atopica). Since being on this combination, Oscar has had no outreaks. Oscar is a food hound and gobbles up his liquid medication without even knowing it, so medicating this boy is easy. Julia & Oscar need a forever home where they will get plenty of attention and have room to roam around and play. They both have very strong food and prey drives so lots of toys, interaction and games keep them happy and occupied. They would LOVE a family with older kids or a work-from-home situation where their caretaker is home during the day. 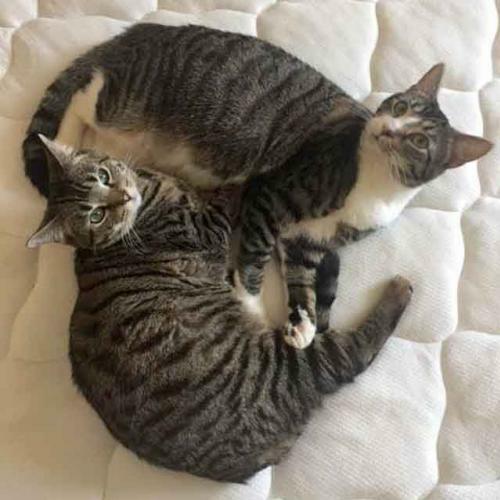 Both kitties are very social and easy-going around people – they will bond right away with anyone who loves them! Note: We are waiving the adoption fee for this pair due to Oscar's special needs.